THE TEMPLE OF BANASHANKARI AT BADAMI THE TEMPLE OF BANASHANKARI AT BADAMI - Shiva Maha Purana, Vishnu Purana, garuda purana, bhavishya purana, skanda purana. The region neighboring the southern parts of Badami in the Bijapur district of Karnataka begins from the Sitimati hills. The landscape is typically that of gnesiss and granite, with irregular rock exposures separated by black soil. Locked in-between two gorges, Badami was the flourishing capital in the Chalukyan days, as could be seen from the extensive historical ruins around the place. The valley is well protected all round by steep sand- stone ridges, and that must have been the principal reason for the choice of this site as their capital by the Chalukyan rulers. Very near to the south of Badami, is the small village called Pareshghad situated in a sand-stone ridge valley having the famous ancient temple dedicated to Banashankari, known as the “Deity of the forests or vegetation”. She is represented as the Mother Goddess residing in the midst of the jungle. In a Kannada inscription at Badami, the deity is described as “Beluvola Banavasi Banashankari”. This deity has been mentioned in Skanda Purana, Devi Bhagavata and a few other books of mythology as a Shakti Devi. Mythology describes that the Devi wore a garment of vegetables. Even today, on the eve of the fair, devotees offer 108 varieties of vegetables as ‘bazi’ to the Goddess. The day is observed as the festival of ‘Bazi’. Banashankari, or more popularly known as Shakambari, was the tutelary deity of the Chalukyan rulers. A large number of devotees in Karnataka and Maharashtra, worship this Devi Banashankari as their revered family deity (Kula Devata), and consider Badami as a very sacred place of pilgrimage. 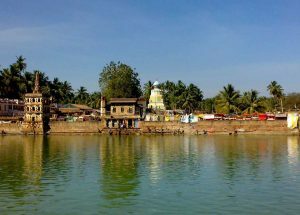 According to mythology, the Devas of yore, sought the Lord’s help by performing a sacrifice at this place, with a view to destroy the wicked demon Durgamasura, who was constantly troubling the people around this region. As per the directions of the Lord, goddess Shakambari appeared through the fire of the ‘Yagna Kunda’, and fought a grim battle with the demon. Finally she destroyed him and brought peace and prosperity to the people. According to the story mentioned in ‘Banashankari Mahatmya’, Shakambari is described as the ‘Deity of nature and vegetation’, and that she manifests as Mahalakshmi, Mahakali and Maha-Saraswati. Historically, it is believed that the original shrine of Banashankari was in existence here, even before the reign of the Chalukyas of Badami. They gave importance to the customs of the Vaishnavas, Jains, Shaivas and Shaktas. But, they were mainly worshippers of goddess Banashankari, the deity of Shakti. An inscription at the temple premises mentions that the Chalukyan king Jagadeka Malla renovated the old shrine of Banashankari and made considerable improvements. A pillar situated to the north of the temple, bears an inscription in Kannada, dating back to 1019 A.D. It describes the bravery of the Rashtrakuta king, Bhimadeva. Another inscription states that the great warrior Ketimayya erected a huge Deepa Stambha (lamp pillar) in front of the temple. The old temple of Banashankari was in the Dravidian style and is said to have been built in the 9th century by the Rashtrakutas. It has now been rebuilt in a modern way. Architecturally, the renovated temple can be assigned to the Vijayanagar times. Covered all round by a high walled compound, it consists of ‘mukha mandapa’, ‘ardha mandapa’ and ‘sanctum’, surmounted by a beautiful ‘vimana’. A very finely carved eight armed idol of Banashankari Devi seated on a lioness is installed in the ‘sanctum’. She is represented as a form of goddess Durga. She carries in her hands on the right side, sword, war bell, trident and noose; in her hands on the other side, skull cup, severed human head, shield and hand drum. She is decorated with all ornaments and her face resembles a full moon. There are three Deepa Stambhas (lamp pillars) before the temple. Likewise, in front of the main gate of the temple, there is a three storeyed structure with a Deepa Stambha on its roof. For some reason, this building is popularly called as the “Mahal of the monkey”. Nearby is a large pond called Harishchandra Tirtha, where the ‘float festival’ of the goddess is celebrated. There are two more ponds known as Haridra Tirtha and Taila Tirtha, which are also held sacred by the devotees. The annual car festival (Ratha Utsava) of Banashankari is celebrated in a grand scale on the full moon day in the month of ‘Pushya’ (December-January). It is a peculiar custom here that the “Ratha” procession of the goddess commences only in the night, just after the moon rises in the sky. A twelve day annual festival is celebrated during this period, when nearly a lakh of pilgrims and devotees assemble to worship the deity. A big cattle fair is also held at this place during that time, which lasts for one month. This has become a symbol of cultural integration reflecting the glory and might of the Chalukyas, Pallavas, Rashtrakutas and Vijayanagar kingdoms. The temple of Banashankari is situated in a picturesque natural setting, and the village surrounded by forest has some of the most beautiful scenery in South India. The Saraswati stream flows past the main temple and irrigates the fields and gardens around. With the abundant gardens of plantains, betel leaves, coconuts, etc., all round the area, it presents a very enchanting panorama and serves as a popular place for picnic and holiday. About a hundred years ago, a group of devotees headed by one Basavappa Setty of Bijapur, came down to Bangalore, and in the year 1915 A.D., they built a small temple for the goddess Banashankari on the outskirts of the Bangalore city abutting the main road to Kanakapura, which is very close to the present extension of Jayanagar. This temple has now grown and developed considerably and is serving as a shining symbol of the popular Shakambari faith. Badami can be reached easily either by train or bus from Bijapur or Hubli. There are regular state transport bus services to Bijapur and Hubli from Bangalore also. Taxis and autos are available at Badami for local conveyance. Taxis can be hired at Badami for sight seeing. There are two dak bungalows, a large tourist rest house and a few private lodges at Badami for the convenience of the pilgrims and tourists who visit to offer worship at the temple of the goddess and see the famous cave temples of Badami hills. The tourist department of Karnataka has a centre at Badami and during the season, a conducted tour is arranged to visit Aihole, Badami caves, Pattadakal, Mahakuta, Shivayoga Mandira and a few other small shrines in the region.